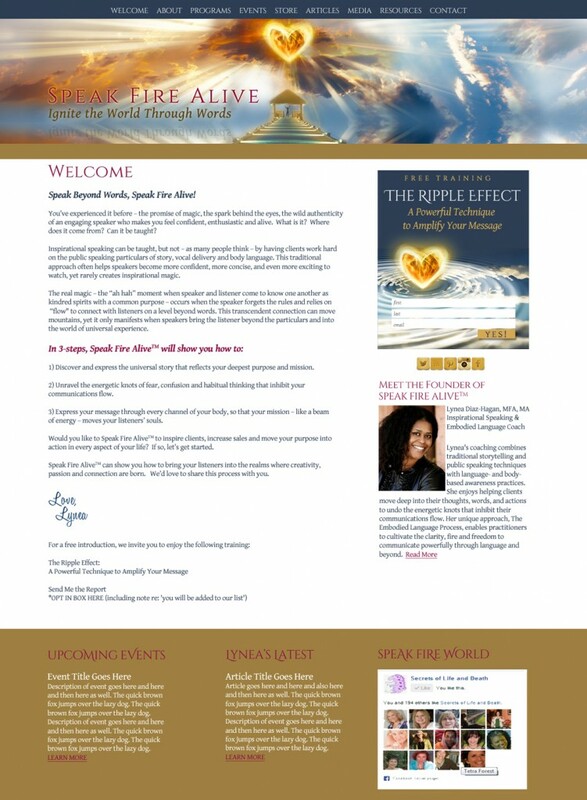 Sitting in the morning chill of autumn with a blanket wrapped around me, I have compiled a few of my latest logo and website designs created for spiritually minded women out to change the world. To imbue these designs with the power of the Law of Attraction, my clients and I engage in an unusually deep, introspective, mystical collaboration. 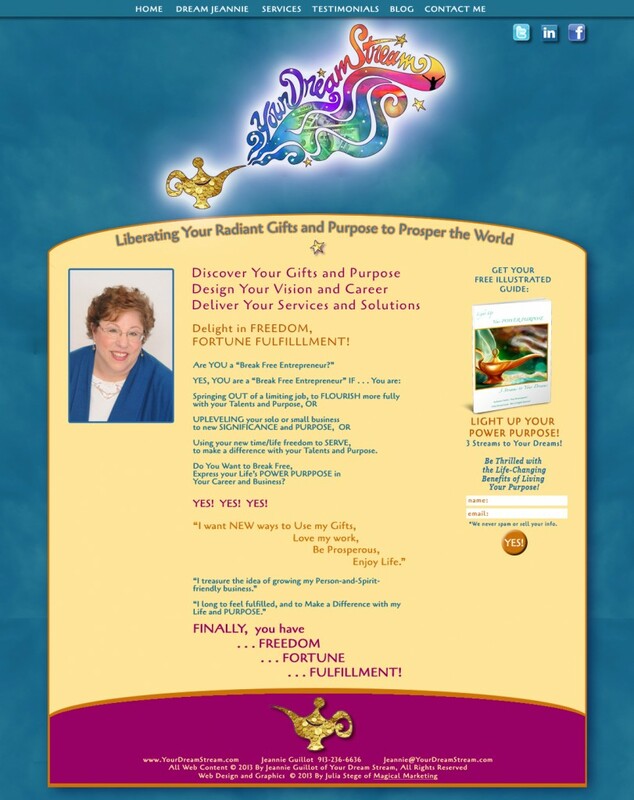 The results aim to be a beautiful, resonant, wildly attractive representation of my clients’ purpose and mission in the world. If you are seeking assistance with your heart-felt brand, logo or website, we are happy to offer you a Magical Strategy Session to determine your needs and offer a proposal. I hope you enjoy this showcase of brands and designs. Lynea Diaz-Hagan was the winner of a free 10-point Website Analysis this spring when she submitted 3 words that described her passion: Speak Fire Alive. These words wound up being the name of Lynea’s new brand and her Wildly Attractive Website. Here is the theme design we are in the process of programming right now. The design is meant to be inspiring as well as authoritative, feminine as well as masculine, creative as well as professional. I feel the collaboration has resulted in a stunning representation of Lynea’s unique work in the world. Eden Glow All Natural Skincare is a home crafted, all natural skin care line developed by Sonja Kluesener in Sonoma County, California. EdenGlow is dedicated to producing truly natural and sustainable products. They create skincare that is both incredibly effective and luxuriously nourishing. Artistically blending science and nature, they formulate products that are as gentle to the environment as they are to your skin; and we are completely cruelty free. They take health and sustainability seriously and believe in giving back. 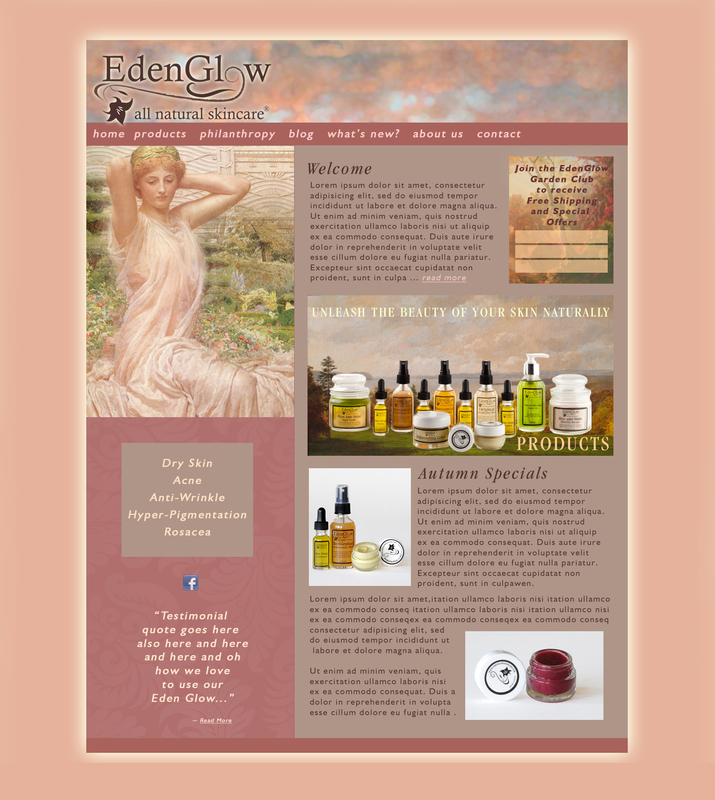 In creating the theme design for Eden Glow we wanted to capture the feeling of being in the Garden of Eden: natural luxury, feminine beauty, sustainablility and science all needed to come through to create the experience of Eden Glow online. Site currently in production. click image to see larger version. Lorelei Robbins’ came to me this summer with the desire to finally brand herself in a way that feels right to her. She had received assistance from other designers who just did what they felt was needed, but not what would represent Lorelei. When we started working together, the first part was to clarify what’s most important to Lorelei. As we spoke, Lorelei shared that her father was a radio personality and when she was just a small child, she did her debut on his show “Robbins’ Nest.” This rememberance became the basis for Lorelei’s new brand “Robbins’ Cosmic Nest” for her career as a mystic and an astrologer. 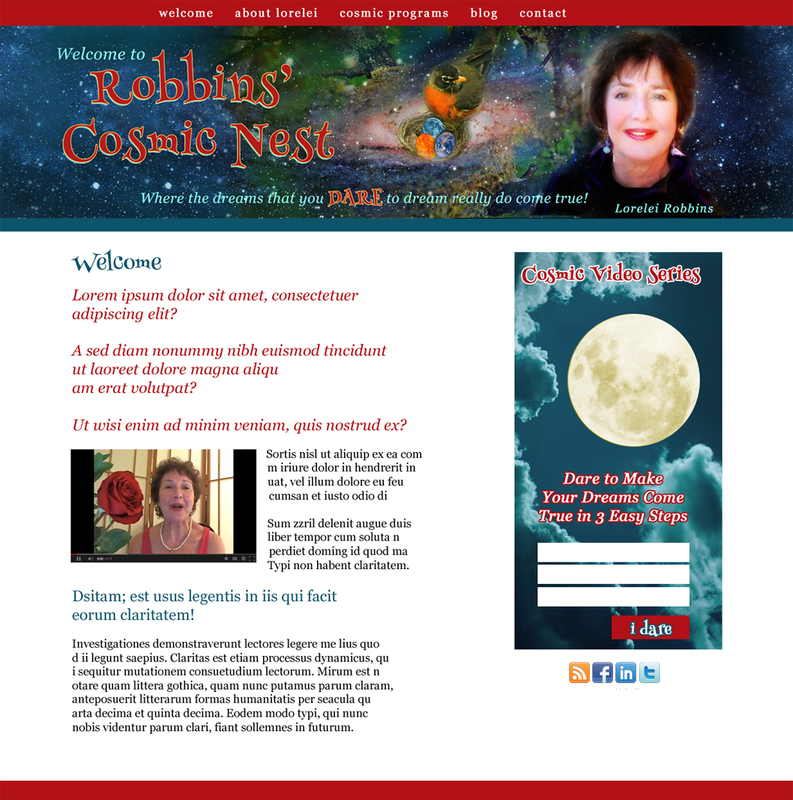 Robbins’ Cosmic Nest is designed to be a space where ‘the dreams that you DARE to dream really do come true.” The site, in programming now, depicts a robin in a nest within the cosmos, the 3 eggs are the Sun, Moon and Earth. Lorelei is over the moon about her new theme and how it not only represents her personality and gifts, but also allows her to continue her family legacy. Click image to see larger version. 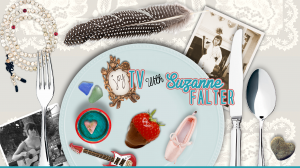 I’ve been working with writer, marketing guru and branding expert Suzanne Falter on her brand for two years. First we developed the Spritual Diet brand which was meant to be about including a spiritual element to our healthy eating diet. Right before we were to launch this brand, Suzanne’s 21 year old daughter Teal died suddenly and unexpectedly. Since then, Suzanne has struggled to create an even cleaner, more authentic life and business. 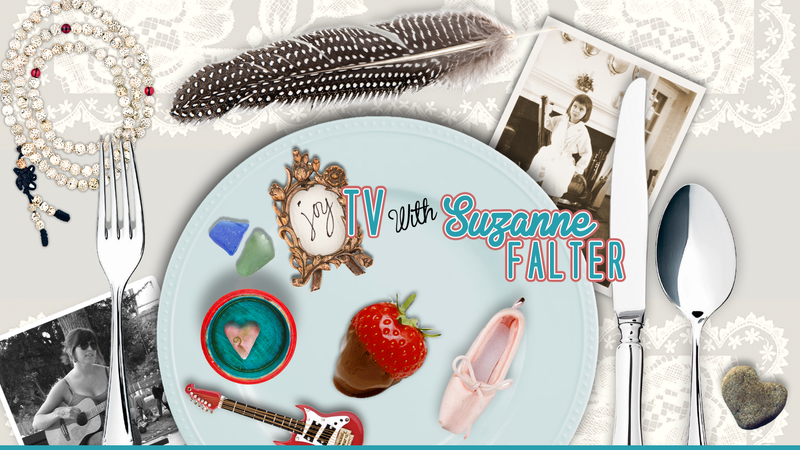 Finally we have decided that her brand is simply her name and tagline: Suzanne Falter Surrendering to Joy. 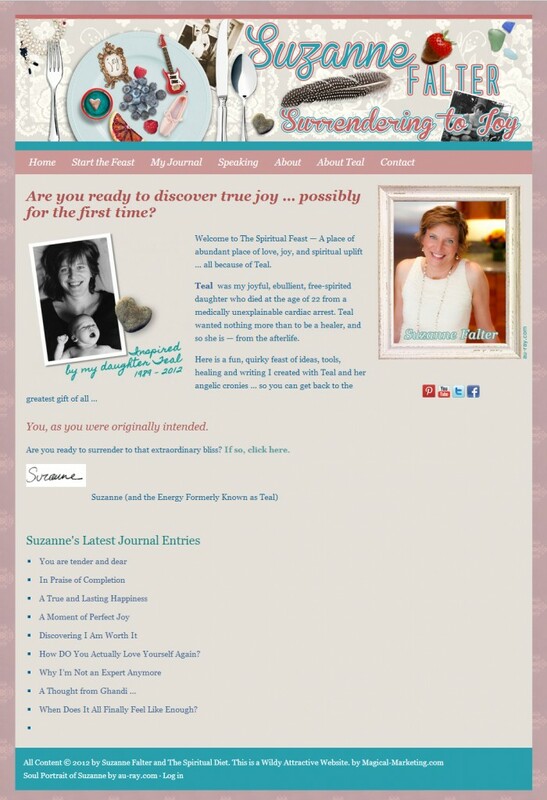 Suzanne’s best selling book How Much Joy Can You Stand forms the foundation for the new brand, and Suzanne’s regular popular blog posts are the current expression of this heart-felt brand. We have taken what we did for Spiritual Diet and revised it with the new brand name. Here you can see the website theme and the new youtube background. Visit http://www.suzannefalter.com to see the new site! Dr. Carolyn West was one of two winners of the Done4You Giveaway this spring. It was her purpose to help those who have been victims of domestic violence and sexual assault that inspired me to choose Carolyn as the winner. I felt that through helping her with her brand, I would be indirectly helping those women. When we got together to develop her logo, we spoke about all the symbols that are most important to Carolyn. What became clear is that the seagull is the best symbol for what she does, and that is offer freedom to those souls who are suffering. We decided that the look would be both professional because she is in the healing field, and also accessible because her clients are women who want to connect with her. I have been working with Florence Yeager on her brand to help her move into serving a more socially and environmentally conscious audience. For years Florence has served the mining industry and when we first started developing her brand, her concern was expressing herself authentically while not turning off her current clientele. During the process of discussing her Attraction Plan, Florence shared a lucid dream she once had where a dolphin came to her and begged her to tell her employer to stop drilling for gold in the ocean. The dolphin showed Florence the faults lining the ocean floor, and demonstrated how if digging is done in the wrong spot, environmental devastation could occur. This dream and the importance of the “Message from the Dolphin” as we call it, led to the creation of this logo featuring the dolphin with the earth in her eye, and the tagline “Voice for the Voiceless.” We are currently working on her website design. 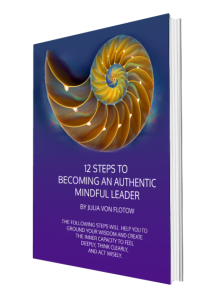 Julia von Flotow is a cutting-edge Authentic Mindful Leadership Trainer and Therapeutic Touch Institute Director. Her brand was too blah to reflect the greatness and originality of her offer. 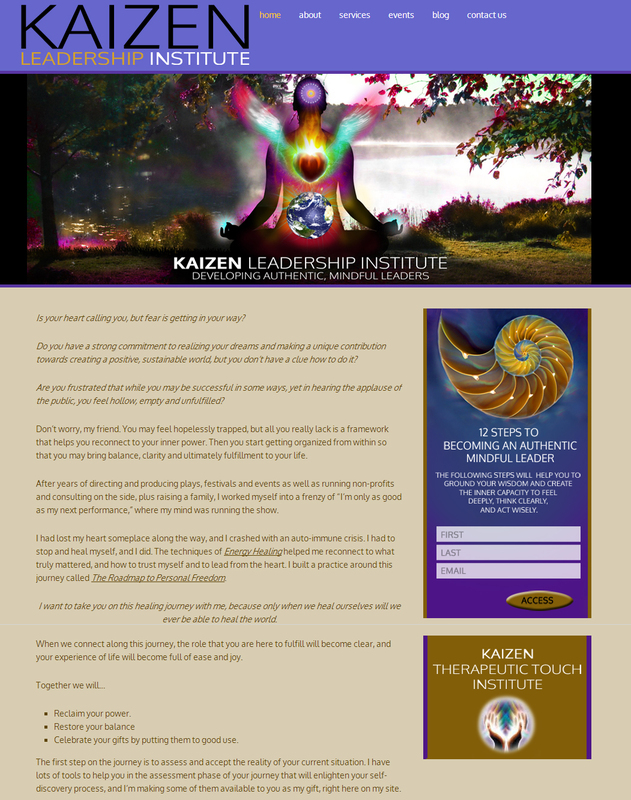 So we got together to develop a new brand and website for Kaizen that truly reflects Julia’s genius. The main image we created for the home page includes a person meditating by a quiet lake. This is the lake where Julia does her morning meditation so this was a perfect selection for her. Then I adorned the meditator with the Earth in the lower chakras, a flaming heart with wings in the heart region, and the sacred geometry in the mind region. 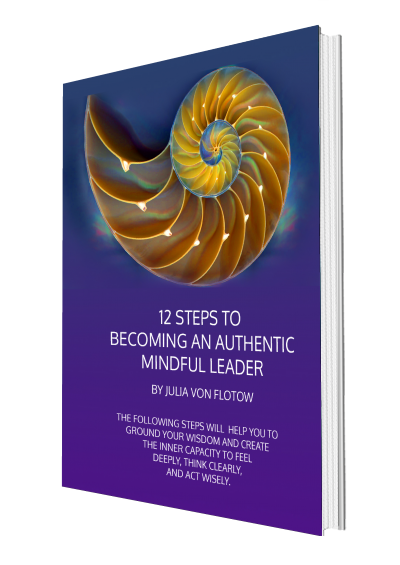 We are currently in the process of developing her marketing peripherals (here is her “12 Steps to Becoming an Authentic, Mindful Leader” brochure) and putting the finishing touches on her complex institute website. Jeannie and I have been working on her brand for a few years. First we went through the Branding from the Heart process to develop her message and name. Her business is to help especially women in transition to create the life of their dreams. I created her logo design which you may have seen in the Magical Marketing portfolio before. We selected a magic lantern to represnt Jeannie’s approach to coaching, as well as to emphasize a magical meaning to her name. The elements in the steam coming from the lantern represent the dream life with beauty, color, and financial freedom. Life had gotten in the way of Jeannie finishing her website content but we have received it and the site is almost ready for launch. I wanted to share the beautiful logo and website theme we created to represent Jeannie’s heart-felt business helping people to live the life of their dreams. Are You Seeking Assistance with Your Brand and Website? If you are seeking assistance with your heart-felt brand, logo or website, we are happy to offer you a Magical Strategy Session to determine your needs and offer a proposal. I see you are still performing at your creative best, Julia! Love the designs! They reflect the vibrancy and soul you bring to all your work. To anyone reading this, Julia is wonderful and fun to work with as well as being a great designer and translator of your soul’s dream. I highly recommend her to anyone who wants to do heart-driven work in the world. Julia, thanks for sharing your beautiful designs. I worked at an ad agency in marketing. I have no design ability but know terrific work when I see it. I could not pick just one as a favorite. Sure wish I had found you years ago.